In our double rooms with individual equipment and relaxed atmosphere you can enjoy togetherness with your loved one. The rooms are equipped with a double bed and you can enjoy the magnificent view of the Wernigerode Castle. A bottle of water is offered to each guest as a greeting gift. Free parking is available in front of the hotel. The use of the swimming pool and sauna area is included in the room price. Would you like to spoil your partner with a romantic weekend? Your four-legged friends are welcome upon advance notification. We charge 15,00 EUR per night / room. The 24 m² rooms are equipped with a double bed and enjoy the magnificent view of the Wernigerode castle. 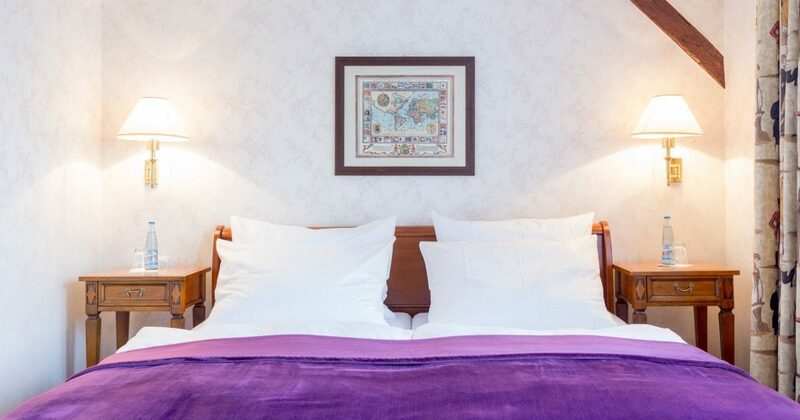 Our 42 m² spacious family room offers separate living- and bedroom for up to four people. A cozy, quiet room with two single beds, a beautifully designed bathroom and a view of the Zillerbach. Our spacious 50 m² suite offers upscale amenities and beautiful views of Wernigerode Castle and Brocken. Our cozy single rooms offer you space for your personal retreat. A desk and free Wi-Fi are available in each room.